Have you ever thought of sponsoring for the good of kids ? Have you thought of the smiles on their faces when you gift them something ? Greenland Public School is a non profitable low income private school located in the slums of Rajendranagar , Bangalore . There are a total of 250 kids with 8 teachers. Till last year, we were functioning in an old building . With the need and desire of providing better facilities we are constructing a new building and providing better facilities for the kids. The funds will be used for buying games , stationary , completion of the building and to sponsor kids who can't afford paying fee. 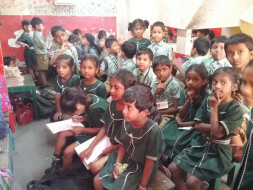 Your little contribution can provide best education for 250 kids.